KoiKoi Japón : Home : Stand up as a Japanese and revitalize Japan more than ever. Japanese high-quality products, low cost, lightweight, and indestructible. Artesaníastradicionales and liquor Japanese "SAKE". Fashion and folk crafts of Colombia. 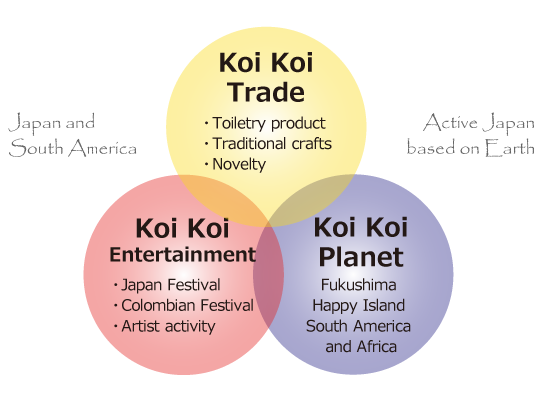 All kinds of Japanese products to Colombia and South America. Japanese Festival Colombia since 2008. Colombian Festival in Japan, etc. Music is love that connects everyone, overcoming racial and cultural barriers. Japanese translation, English and Spanish. make the project more livable than the old land. we will introduce to the world's developing countries, including Fukushima.